Howdy Ya'll! 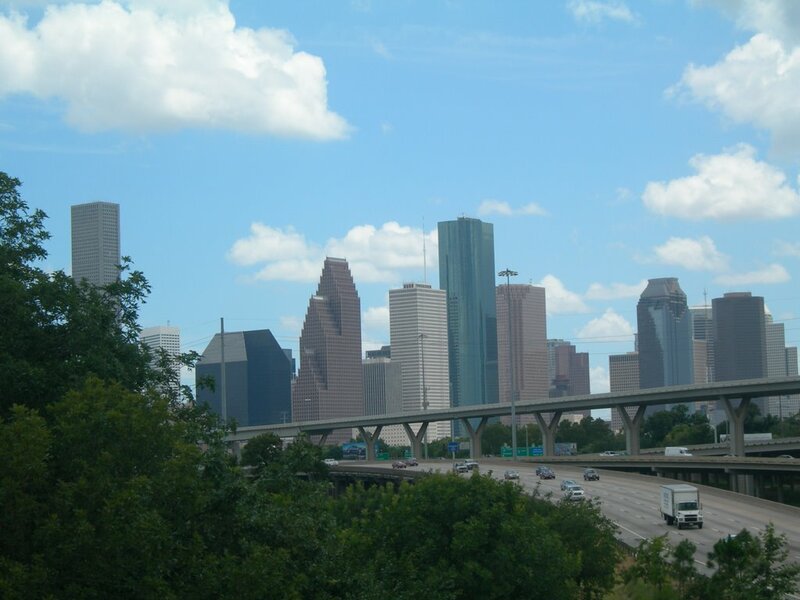 Everyday we will post a random picture from the great city of Houston, Texas. 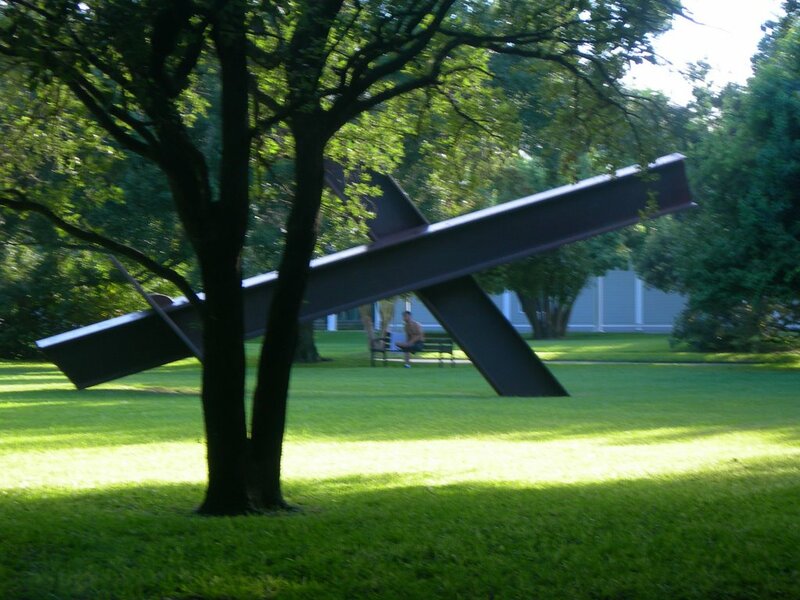 Come...See...Experience Houston! If there is anything we can do for you...snap a picture, send a postcard, swap links...just let us know! No matter where you turn here in Houston, there is construction. I guess "they" figure it is important to keep up with the times...keeping everything updated is essential "they" think. I believe there is both good and bad in wanting to "update" things. Sometimes we lose our history when things change so rapidly...we lose our city's character. On the other hand, there is no sense in keeping an abandoned, run down, building smack dab in the middle of the city either! cathedral on full city block. Romanesque style building with 12-story bell tower. Pre-Construction: Construction to begin 2005 or later. 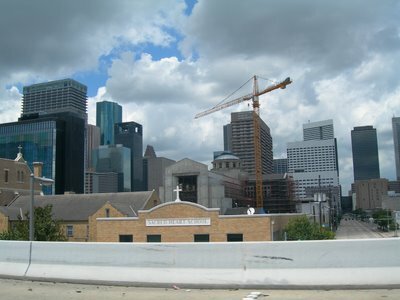 *Honestly, we Houstonians get so used to construction around here you almost don't even notice it. When you do a blog like this you really get a chance to step back and look at your city from a "visitor's" perspective. For that I am thankful! Here is another great view of downtown. This is getting onto I-45 heading north from Beltway 8. 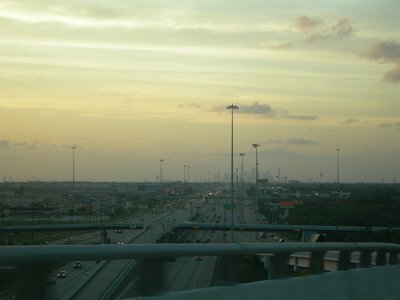 For those of you who are visual learners, Beltway 8 is a tollroad that makes a huge circle around the city and I-45 runs straight through it. That one roadway you see elevated in the middle of the freeway towards the center of the picture is what we call the HOV (High Occupancy Vehicle) Lane. I take the HOV lane everyday to and from work, and it does save alot of time. The whole idea of the HOV lane, and the system itself is truly incredible! I love this garden picture I took. 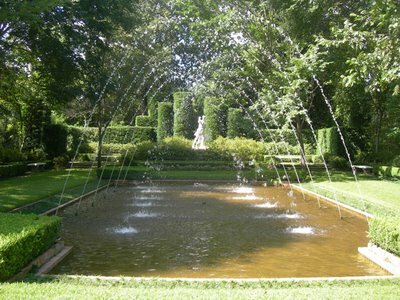 It reminds me of the queen's garden on Alice in Wonderland. 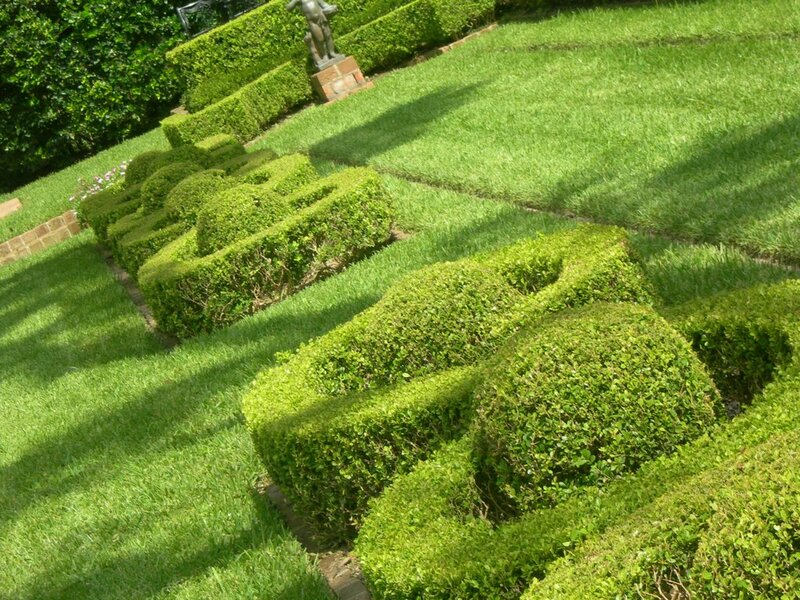 I think the bushes look fun! 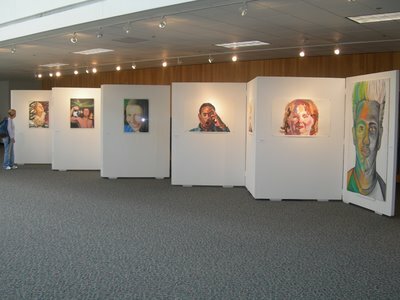 Outside of the library on campus they have several self portraits on display. 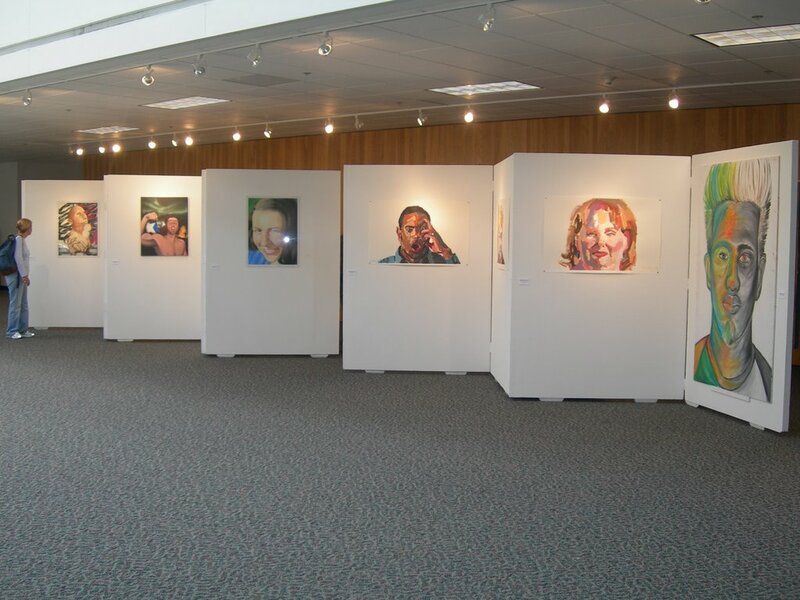 I enjoy looking at them all and trying to understand what the artist is portraying. What do you think about the first one on the right...or what about the third one on the right? 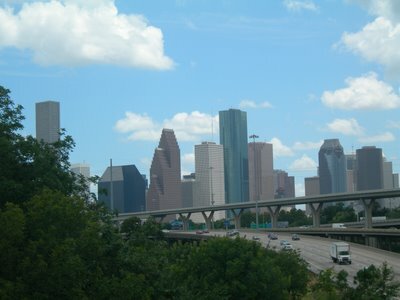 This is another shot of downtown...I love this view. This is on the north side of town looking south towards I-10. My favorite building is the pointy brown one towards the middle that looks like steps. I think it is unique and it really stands out. Enjoy the rest of your weekend...Candice. This is Elvis, the man of the house. (I haven't left the house today so today's pic is a wild card!) Last summer we converted our garage into a game room with a ping pong table and other fun things...and today we are organizing and straightening it up. Elvis was extremely helpful! 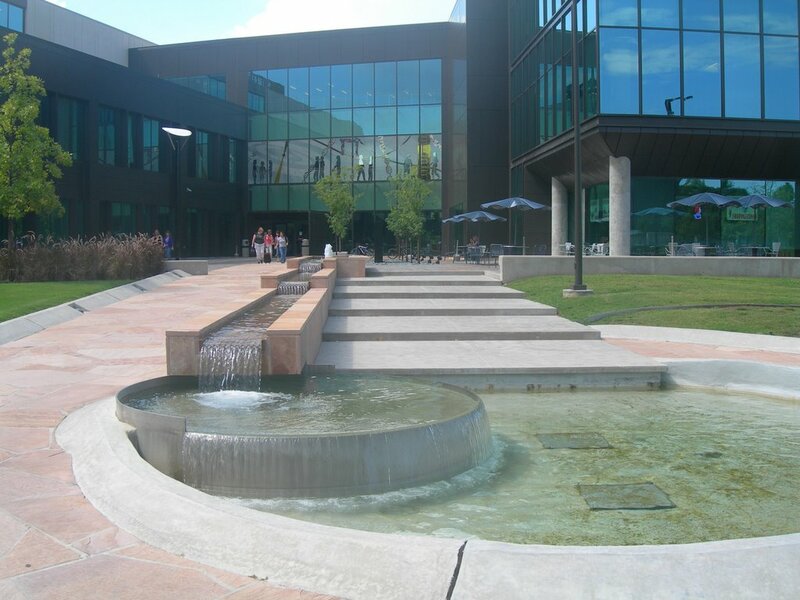 This is the Student Services Building at the University of Houston - Clear Lake, the newest building on campus. 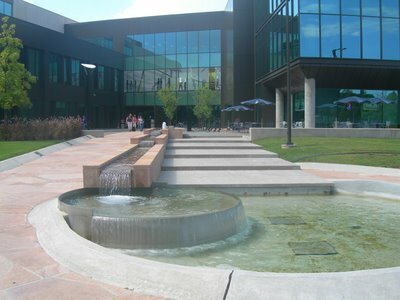 I took this picture yesterday after my Marketing class. This is a slow part of the day...most of the students at UHCL are night students...which makes for a more professional atmosphere. 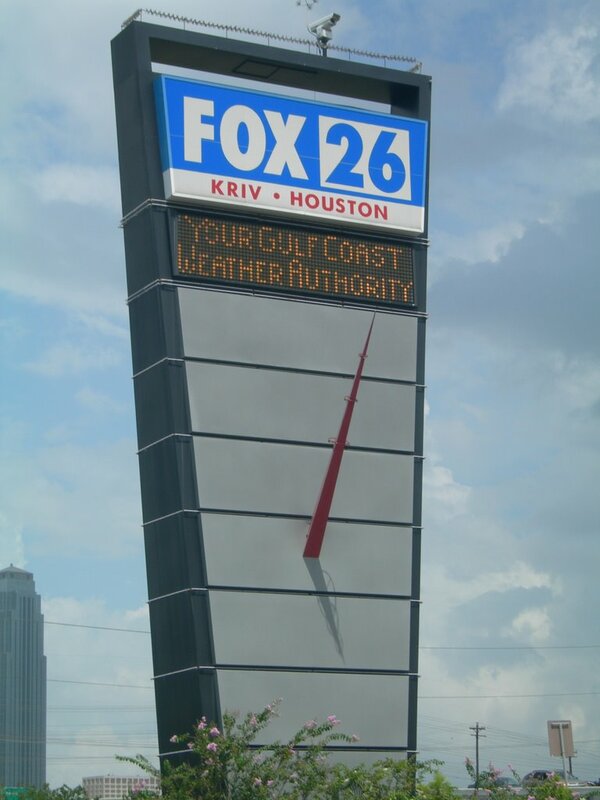 Here is the sign for the Fox 26 News building. I work right next door, so I can see this sign from my office window. What do you think that red pole thing is? 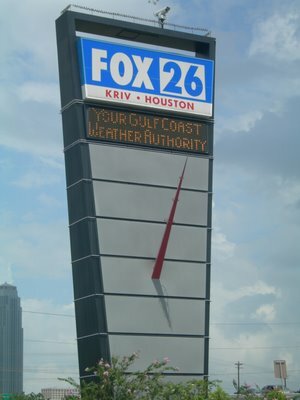 I work right by Fox 26 News here in Houston, and this is their tower. I thought this was a pretty cool shot. It was raining and hazy that day...just like it was today. 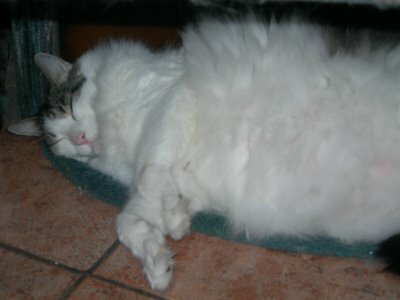 I posted this picture today because I need total relaxation...I think this is it, don't you? 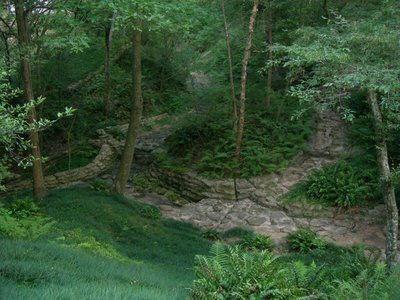 I took this close to Bayou Bend, and I think it is amazing that you can find places like this in Houston. Unfortunately, It is rare to see so many trees here. This picture is not the greatest (none of mine ever are) but these are the fawn on Campus. I was leaving class one day and someone was stopped on the road, so I looked to see what they were looking at. I looked closely and saw these two babies grazing and playing. The mother had just crossed the street and let the babies lolligag behind. We have several animals on campus...which is rare in Houston. It is very refreshing. 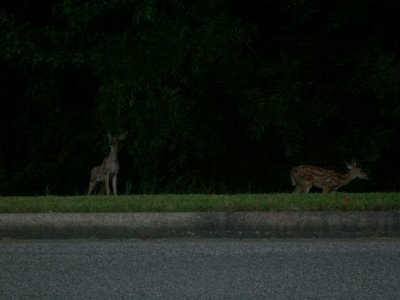 I start up classes for the Fall Semester today...I hope I see more deer! 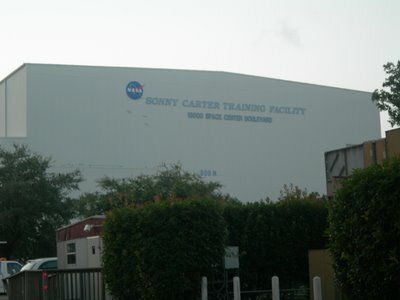 I drive by the Sonny Carter Training Facility on my way to class everday. 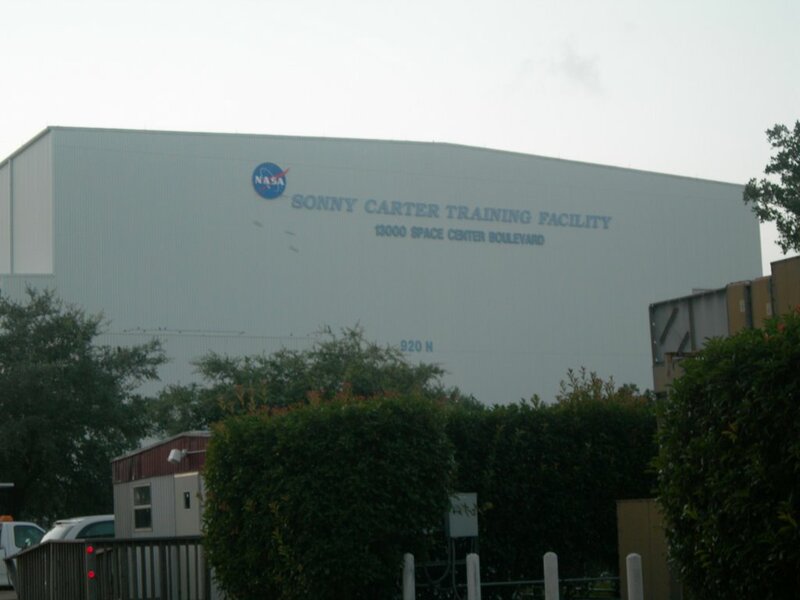 Of course it is obvious that this is where the Astronauts "train"...but did you know that inside this building is a Neutral Bouyancy Lab? Certain scenes from Space Cowboys and Armageddon were actually shot here...Read this article to learn more! (These pics are great as well.) When you get a chance check these out. Hope you had a great weekend...Candice. 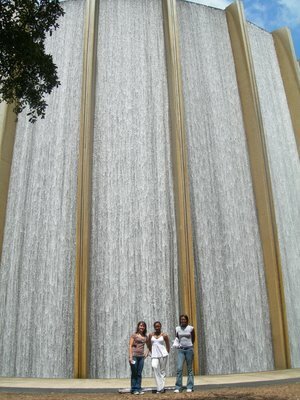 Actually, it's our own Water Wall in downtown Houston. 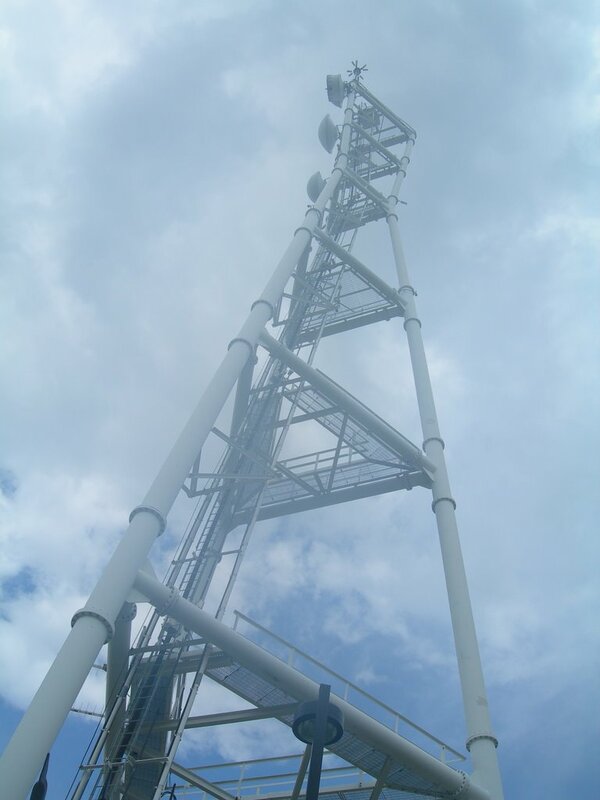 See how tall it is? On the left it's my friend, Nikita, my other friend, Samantha, and my other friend, Kristen. It was Samantha's birthday and she got a limo that we could ride all around in, downtown. Bonjour! Ca VA?(Hello! How are you?) 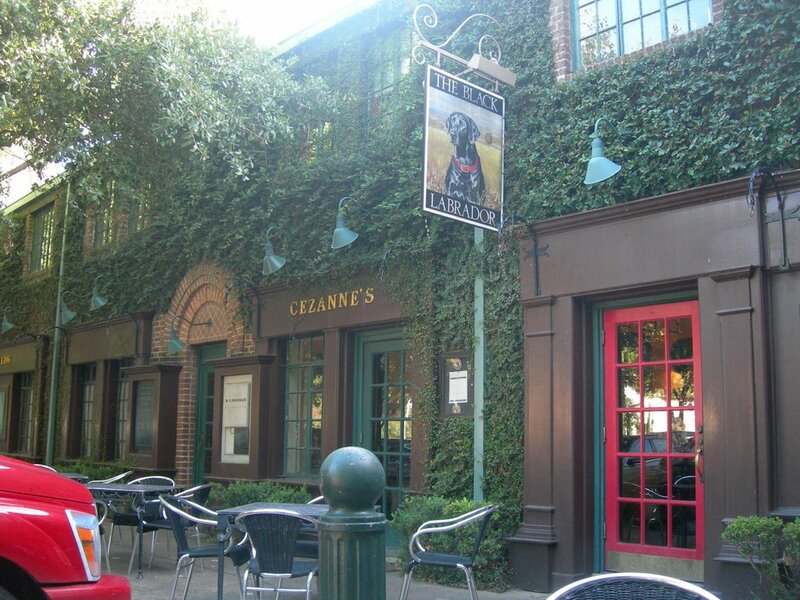 Since we took you to London,(wink,wink)we thought we should take you to Parie! 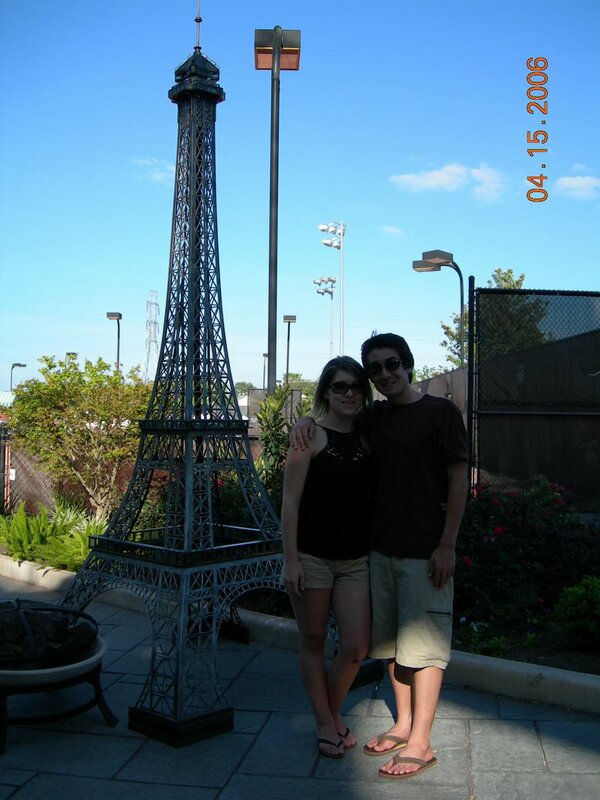 This was at the Westside Tennis Club in Houston & they had this Eiffel Tower replica. I thought I should take a picture of my sister, Candice, and her boyfriend, Luis, since my sister loves Paris! She went her senior year in high school. Mattress Mac sent her with a few other people. She won one of his contests by writing an essay about why she wanted to go. He likes tennis so they went to see the Davis Cup. If you need to make a phone call when you're at the Black Labrador, just step outside and make your call in this London-style phone booth. This is one of the greatest things about the Upper Kirby area I think. 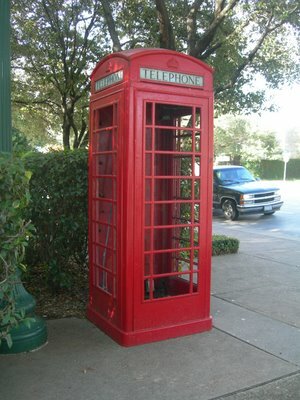 You are completely transported to the UK when you see a red phone booth like this! 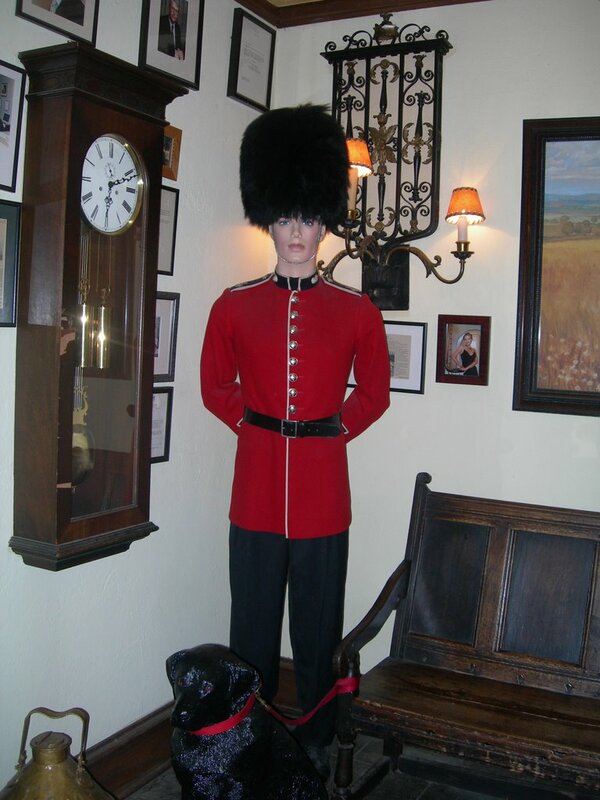 As you walk into the restaurant to be seated, a "guard" greets you. This is a great scene...I love the way they have decorated this little corner. If you notice there is a black labrador with a red collar tied to the bench. Welcome to the Black Labrador! 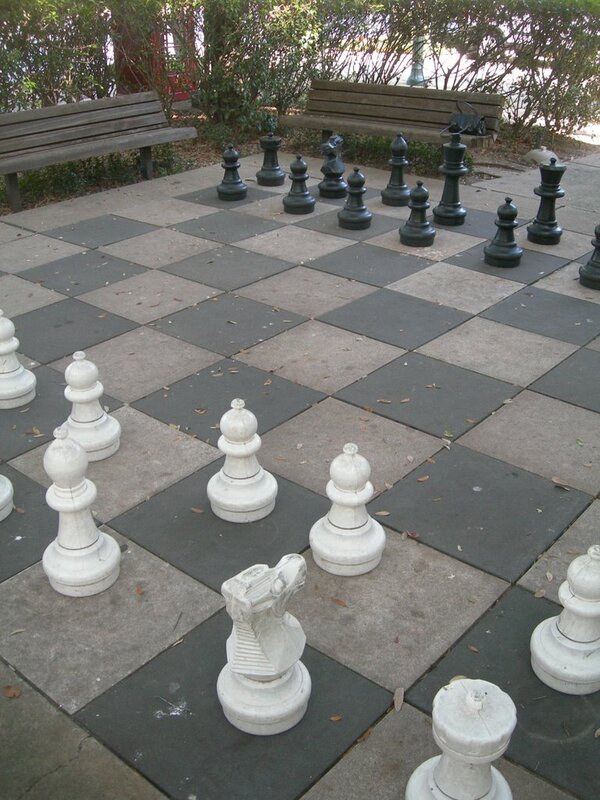 This is the huge chess set outside at the Black Labrador. I took this picture because I thought it looked really fun. At the Black Lab you can sit inside or outside. This day we sat outside, but we weren't able to play chess because it was already occupied. We will have to play it next time. There is a great authentic British Pub here in Houston called the Black Labrador. 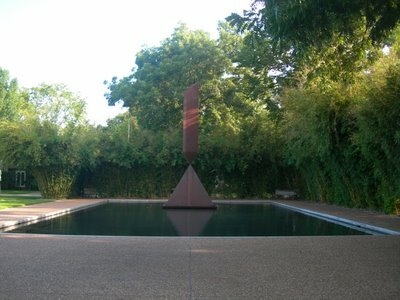 It is in the Upper Kirby area off Montrose. This is my favorite British place in town. I went to the UK the summer of 2003 and I loved it! I miss it and the Black Labrador is a great way to bring back those memories. They have great English Specialties such as Fish & Chips, Beef Wellington, Shepherd's Pie, Ploughman's Lunch, etc. For the next few days, I will share some pictures from the Black Labrador that I think you will enjoy. See you tomorrow. 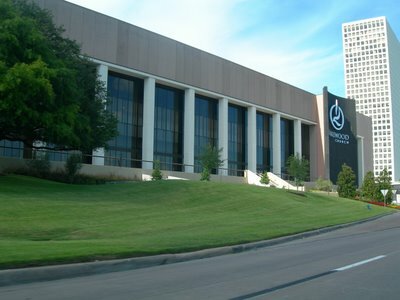 I decided to post Lakewood today, because we are watching Pastor Joel Osteen preach on the telly now. He is the pastor of Lakewood Church, reportedly the largest church in the country. It is about two minutes from my work. 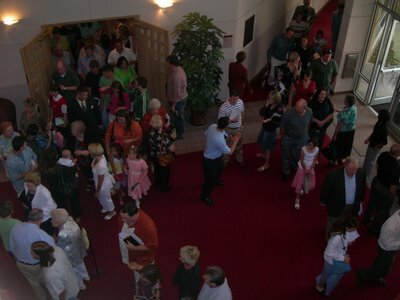 Every once in a while the cameraman will pull out and scan the crowd, and it is amazing to see how many people go to Lakewood. I took this picture because it looks just so relaxing. Don't you think? This statue, called Broken Obelisk by Barnett Newman, is located in the Museum District once again in the Menil Collection. The water was perfectly still...there was no noise...and the sun was starting to set. I just stood there and watched for a few minutes enjoying the scene. I really like the bamboo plants surrounding it also. 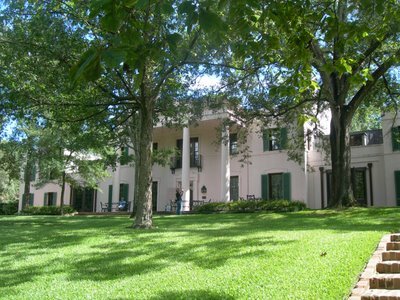 These "children" are on a winding trail at Bayou Bend that leads from the front of the house toward Buffalo Bayou in the back of the house. 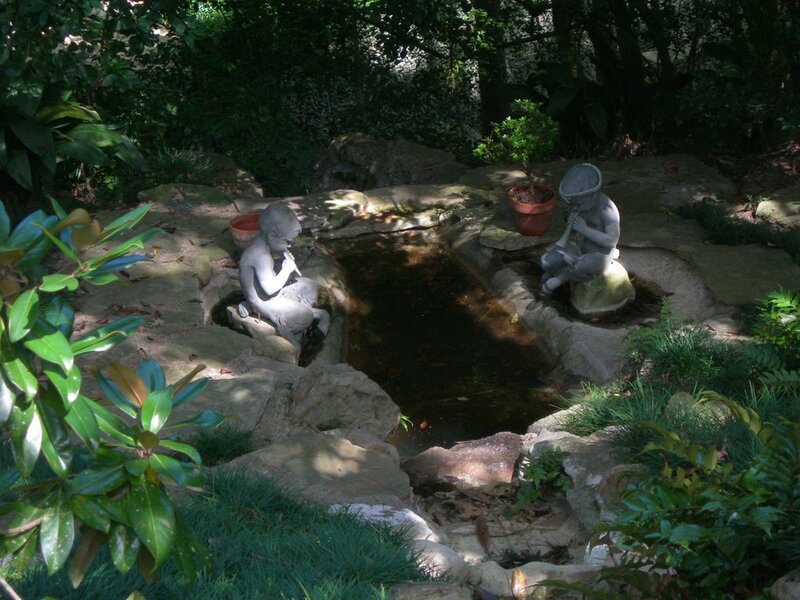 It is hard to see, but the children are playing musical instruments into a tiny pond. I took this picture because it reminds me of what Bayou Bend might have been like when Ms. Hogg was there. I guess it's...just the fact that she picked those specifically for that little spot on the trail. 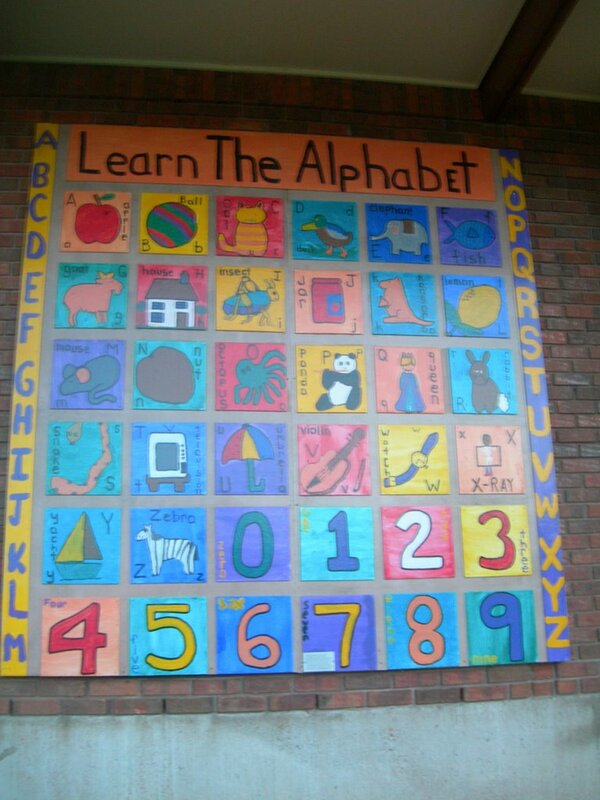 This painting is on the side of an after school recreational facility in my neighborhood. Today several Houston kids are heading back to school! Megan is actually in the process of getting ready now. I think next year they have decided not to start school until after Labor Day in September...that will be nice. Have a great day at school, Megan! 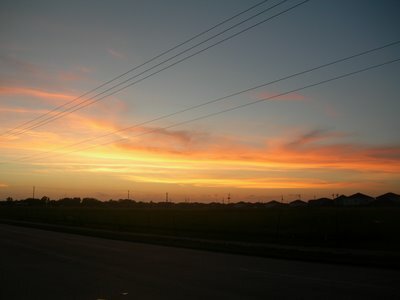 Lovely Sunset for a Lovely Day! Today has been incredible! I posted this picture today because I love sunsets, and today has been just as lovely. I think my favorite part about a sunset is that they are never the same... they are each as different as the day they follow. Hello everyone! This is Megan! These are my sister(Candice's)flowers that her boyfriend got her one day. We are having to use older pictures that I took because my camera is in the shop getting fixed because of an unfortunate accident. Two actually. I didn't cause the accidents though, just know that. Well have a great day! God bless!! *Ahhh, today my bf and I have been dating for a year! 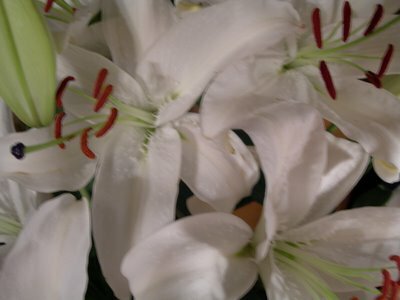 (That is why we posted the lilies today.) He is the greatest! Good night! Saturday I showed you Ms. Ima Hogg's house, and today I thought I would show you her backyard. This is the Diana Garden, named because the statue in the back is that of Diana, Goddess of the Hunt. Have a great day. I took this picture this morning right after church let out. 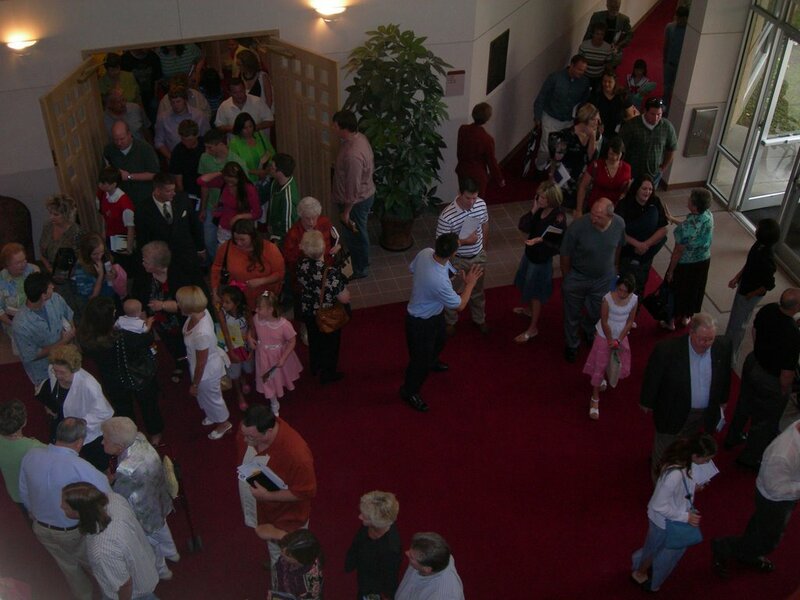 Everybody is always in a rush to get to lunch, but the Narthex, or foyer, is rather crowded so it slows everyone down. We had Chinese food for lunch today, I went and got my nails done, and I did a little shopping. It has been a relaxing Sunday. 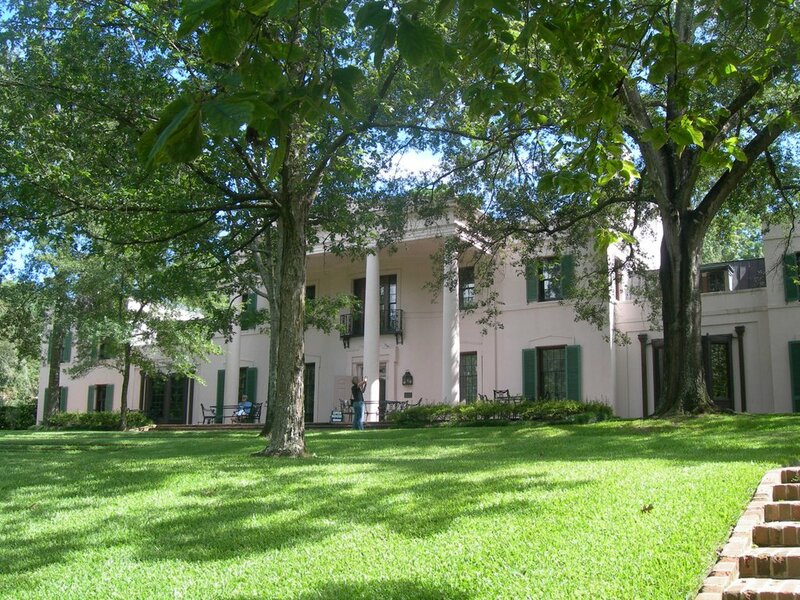 Bayou Bend was the home of Ms. Ima Hogg, daughter of Texas Governor, James Stephen Hogg. Ms. Ima donated her beautiful home to The Museum of Fine Arts, Houston in 1957. The museum has done a great job of maintaining the home and it's originality. Friday is my absolute favorite day of the week! I love Fridays! Shopping is also a favorite of mine. These mannequins are located on what is known as Westheimer Curve advertising a cute boutique across from the Buffalo Exchange. 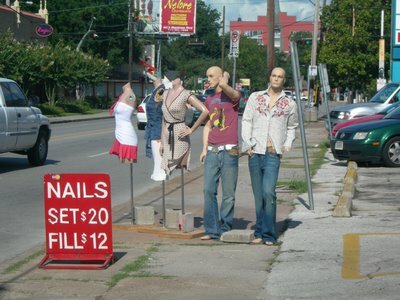 The shops on Westheimer are all about bargains, trading, and saving. It's a fun and funky shopping experience. Only in Texas could you find a stainless steel armadillo! 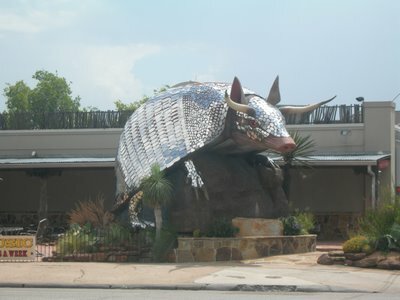 The shiny roadkill is located on Kirby, one of the busiest streets in Houston, advertising Goode's Armadillo Palace. Here they have live music, great food, pool tables, domino playing, a gift shop, shuffleboard, a whisky bar...anything and everything associated with Texas. Good morning! 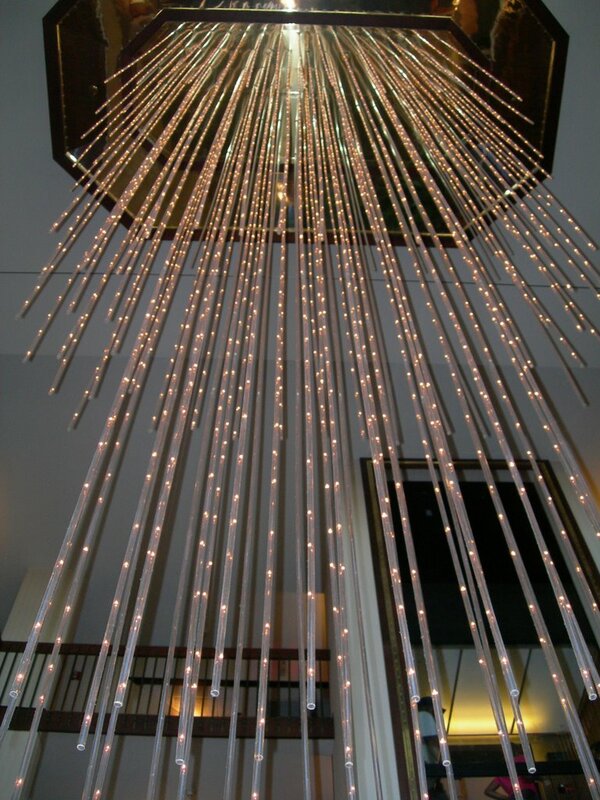 This chandelier is inside a hotel called Drury Inn off Interstate 45 close to Hobby Airport. When I drive home from the city I can see it, and at night it is stunning. 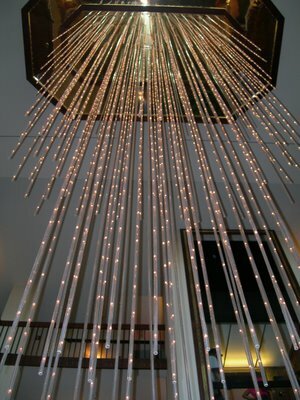 I had never actually seen the chandelier upclose...Now that I think about it, I have never even been inside the hotel except to take this picture. I've seen it a million times, but only now have I actually seen it. Museum's history is fascinating. Check it out if you have time.) From this view, I liked the split tree in front of the fallen "tree." Have a wonderful day!